Update: Since August 2015 Instagram now allows portrait and landscape images which means this tip will no longer work as it relies on images being square. If you only shot square photos this tip will still work if not I am afraid you are out of luck. Instagram photos strip out certain EXIF data embedded in them like camera type and aperture info. You can use this to your advantage if you want to just view Instagram pictures buy making a smart folder with a couple of simple rules. Make sure you are in the Library module. Create a new smart folder buy clicking on the + at the top of the Collections tab, then give your new smart folder a name. The first rule is to only show images with a ratio of 1 x 1 (square), set the tabs to “Aspect Ratio”, “is” and “square”. The second rule is to only show images that have nothing set as the camera type because that info is not present in Instagram images, click the little + at the end of the first rule and in the new tabs select “Camera”, “is” and leave the last field blank. It’s not totally perfect because it will also show your Hipstamatic images and another other square iPhone images that have been created by other apps. Also if you have cropped Instagram images and they are no longer exactly 1:1 the will not show up in this smart folder. That said it’s still way better than manually trawling through all your iPhone photos picking out square ones. If you found this interested I’ve written more of my Lightroom tutorials and tips. I was inspired to write this by Ade Oshineye as he pointed out to do this Apple aperture. Seeing as I don’t really know anyone that uses Aperture I thought I would bring it to the masses ;-). This entry was posted in Adobe Lightroom, iPhone, Software, Tutorials and tagged adobe, Adobe Lightroom, Instagram, iPhone, lightroom, tutorial, Tutorials. Bookmark the permalink. A slightly irrelevant question — I like geotagging my pictures on Instagram (gmr83, follow me!) and I usually take a picture of the same scene with my iPhone and another with the DSLR. Sometimes I want to use the DSLR version because its better and I still can’t find an app that allows me to edit the EXIF information in a way that would allow accurate geotagging on IG. My DSLR allows GPS and geotagging although I’m not sure if that is related. The last app I tried is EXIF-fi. So are you tying to apply copy the location data from a iPhone photo to a DSLR photo? If that’s the case it’s easy. In the Library module in Lightroom select your DSLR photo then select your iPhone shot so they are both selected. 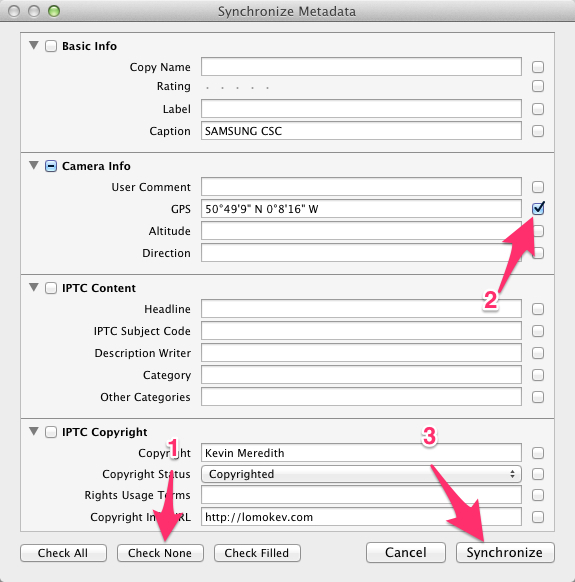 Then click on “Sync” in the right had column. Probably best if tick “Check None” then scroll to the second item and tick the GPS item then “Synchronize”, your DSLR photo will now have the same location data as the iPhone photo. Wow! That does look easy! I’ll give it a whirl and see! Thank you so much!